The Simpsons: Bart vs. the Space Mutants is a platformer and the first game based on the animated TV series. As Bart, your mission across five levels is to wipe out aliens that are invading Springfield. To do this, you must collect, spray paint or destroy certain items that the mutants need to build their Ultimate Weapon and take over the world. Helpful power-ups (such as Rockets and Cherry Bombs) are available at local stores, and X-Ray Glasses can be used to distinguish aliens from humans. The game's biggest problem is its jumping mechanic, as there's a slight delay between pressing the button and Bart performing that action; this leads to many unfair deaths, especially if you're taking a run-up, as you'll likely move a few extra pixels along before the leap occurs, and land directly in the path of an alien. What's equally annoying is that button presses are sometimes ignored completely, usually when you're trying to jump from platform to platform. To top it off, the collision detection is spotty and it's possible to fall straight through platforms. Level 1 is far too rigid and trying to spray-paint objects can be an exercise in frustration; the main reason for this is that you usually need to be in a specific spot for the game to register your intentions and turn the object from purple to red. Level 3's balloon popping gimmick is decent and the ability to play carnival games for extra lives is a neat idea. Level 5 is tedious though, as you aimlessly wander around the Nuclear Power Plant searching for power rods. Eventually, the gameplay grows tiresome and the continual objective to collect items just isn't a strong enough hook or incentive. 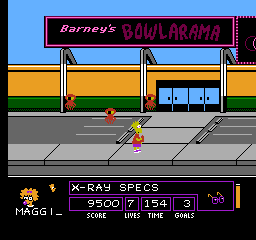 The developers did do a good job of depicting The Simpsons' world though, such as allowing you to ring the tavern for a hearty laugh at Mo's expense, or when Nelson tries to knock you off your skateboard. The Simpsons: Bart vs. the Space Mutants certainly deserves praise for trying something new, but it fails to execute the most basic elements of a good game, namely precise controls and engaging action. While it had the potential to be an above-average NES title, it's simply too frustrating and unfair to recommend. Random trivia: Ports were released on numerous other systems, including the Commodore Amiga and Sega Game Gear.